There are great summer events happening in Ontario and Quebec, Canada. Kids can make a Caribbean windsock, get their face painted and enjoy roving Moko Jumbie stilt dancers! There will be an entertaining and captivating dance show. Festival Kompa Zouk Ontario Presents: Tabou Comb. Tabou Combo’s high-energy style of kompas dance beat knows no language barrier. Claire Martin, award-winning senior meteorologist for CBC News Toronto and The National, will take to the stage to welcome audiences and introduce Tabou Combo. Moko Jumbie: Dancing Spirits of Trinidad Workshop: August 4 – 5, 2013. This hands-on workshop is an elementary introduction to the traditions of Moko Jumbie (stilt-dancing spirit of the forest) and all of its transitions from Africa to the Caribbean and Canada. Using specially designed short training stilts sized for children, two senior instructors will lead a stilt-dancing workshop. Dancehall Heat & Socalicious Dance Workshops: August 5, 2013. Instructor Kay-Ann Ward “brings the heat to Island Soul with her popular dance workshops. Dancehall Heat borrows heavily from the Jamaican culture. Learn fundamental moves and a dance routine plus so much more! Toronto Caribbean Carnival 2013 with their “Show us your true colours Toronto” commercial airing on CTV. Caribbean Carnival Toronto festival celebrates Caribbean music, cuisine, revelry as well as visual and performing arts. The marquee parade is the showcase of the festival. After months of preparation, “masqueraders in colourful and striking costumes” with steel pan bands wind their way from Exhibition Place along a 3.5 kilometre stretch on Lakeshore Boulevard. Please click here for more info about the Grand Parade of the Scotiabank Caribbean Carnival Toronto. This Sat., Aug. 3, the TTC will provide additional service for customers heading to the Scotiabank Caribbean Carnival Toronto parade. Due to track construction on Queens Quay, streetcars on the 509 have been replaced with buses. Customers are encouraged to consider alternate routes to the parade, such as the 511 Bathurst, 29 Dufferin or the many special express bus routes that will service the parade. and 509 Harbourfront replacement bus from Union Station to Exhibition Place. As well, this weekend, use a TTC Day/Family Pass. For $10.75 a day, a TTC Day Pass provides unlimited one day travel for a group of up to six people, maximum two adults and not more than four children/youths 19 years of age or under. The pass is valid from the start of service until 5:30 a.m. the next morning. Look for the TTC and Wheel-Trans buses in the grand parade. This will be the fourth consecutive year that the TTC will be joining forces with Toronto Raptors centre Jamaal Magloire and the Toronto Revellers marchers. The City of Toronto is holding a cat adoption blitz this weekend only. Residents can go home with a kitten or cat without paying the usual $75 adoption fee (there is a $15 pet licence fee, or $7.50 for seniors) from one of the City’s four animal shelters and at a number of adoption partner locations. All cats and kittens are sterilized (spayed/neutered), micro-chipped, vet-checked, de-wormed and vaccinated. About 375 cats and kittens were adopted during this summer’s Feline Fiesta blitz across the city. There is still an immediate need to find permanent homes for more than 150 cats and kittens. Recent changes to the City of Toronto Municipal Code Chapter 349, Animals, take effect on August 1, 2013. Toronto residents may now have six cats per household, an increase from the three cats previously allowed. If you want to adopt a kitten or cat, visit a Toronto Animal Services shelter in your neighbourhood. For a list of the City’s adoption partners, please click here. 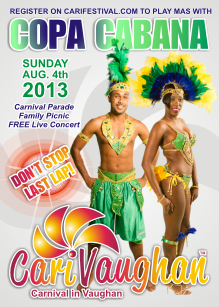 CariVaughan is a one-day event devoted to celebrating Caribbean cultures in the City of Vaughan. Fort York Opens with FREE admission from 10 a.m. to 5 p.m. Lieutenant Governor of Ontario Visits Fort York: 1 p.m. – 2 p.m. The Honourable David C. Onley, Lieutenant Governor of Ontario, will be at Fort York National Historic Site on Simcoe Day, August 5, to celebrate John Graves Simcoe, the Lieutenant Governor who founded Fort York and the Town of York, now known as Toronto. The Lieutenant Governor will be joined by City of Toronto representative Councillor Shelley Carroll (Ward 33 Don Valley East). A parade and salute to the Lieutenant Governor will be performed by re-enactors uniformed as King’s troops from the War of 1812 era. The Ontario Black History Society will also be participating. Activities for visitors include the following. Learning about the first Lieutenant Governor and his connection to the Slavery Abolition Act of 1833, which, decades after his death, ended slavery in the British Empire on August 1, 1834. Enjoy tours, exhibits, musket and cannon demonstrations, and fife and drum music. Also, enjoy historic cooking in the 1826 kitchen, while learning about Simcoe, the founder of York and Fort York. For more info, please click here, or call 416-392-6907. Many recreational attractions, as described here, will be open on the August 5 civic holiday. Please note that community recreation centres and City offices will be closed that day. Residents can make a splash at the City’s 58 outdoor pools, 106 wading pools and 93 splash pads. For more info, please click here, or call 311. All five City-run golf courses will be open at holiday rates on August 5, weather permitting. Rates vary among the golf courses which are listed below with phone numbers to call for rates and other info. Riverdale Farm at 201 Winchester St. will be open from 9 a.m. to 5 p.m. on Simcoe Day. Families can enjoy a self-directed tour and meet the farmer at 11:30 a.m. for a farming demonstration at the lower Francey Barn. Zoo admission and activities are FREE. For more info, please click here, or call 416-392-6794. Located on Deer Pen Road, the High Park Zoo offers domestic and exotic animals, and many of them have babies this time of year. The gates open to visitors from 7 a.m. to dusk. Just minutes away from downtown by ferry, the Toronto Islands offer a variety of fun for the whole family. The islands are a great place to walk, roll, cycle, explore and view the city skyline. A wide variety of flowers are in bloom at Allan Gardens Conservatory, 19 Horticultural Ave. The conservatory is open from 10 a.m. to 5 p.m. Please note that the conservatory in Centennial Park is closed for repairs. The Shared Path, the newest of the City’s Discovery Walks, features 15 kilometres of trails through a series of park areas along the banks of the Humber River. The Discovery Walks program is a series of 10 self-guided walks linking ravines, parks and neighbourhoods. Ranging from 1.5 to 18 kilometres, the walks showcase Toronto’s outstanding natural features, as well as cultural and historical attractions. Please click here for info and maps. Ontario Power Generation (OPG) has partnered with the Bruce Trail Conservancy, Earth Rangers, LEAF, Ontario Nature, Rouge Park and Trees Ontario to support important programs and events. Explore the world of bats and learn what role they play in natural ecosystems. A Taiko Tale of Two Cities: August 8 | 7pm. Toronto’s Japanese drumming ensemble, Nagata Shachu, welcomes Jason Matsumoto from Chicago’s Ho Estu Taiko, for an evening of exhilarating rhythms, along with festive melodies on bamboo flute. Jardins migrateurs / Itinerant Gardens: August 11 | 4pm. Montreal’s Constantinople Ensemble presents a poetic encounter between strings and voice, from the epics of the Mandingo Kingdom to the music of the Persian court. Ablaye Cissoko (kora and vocals), Kiya Tabassian (setar and vocals), Pierre-Yves Martel (viola da gamba) and Ziya Tabassian (percussion). Arcadian Visions: August 15 | 7pm. Montreal-based violist Pemi Paull presents music by from the 17th century to today, by Oesterle, Hovhaness, Enescu, Gabrielli and Mahler. Cajun in the Cattails: August 18 | 4pm. Toronto’s own traditional Cajun band, Swamperella, transform the Music Garden into a Backyard Bayou. Soozi Schlanger (fiddle, vocals), Peter Jellard (accordion, fiddle, vocals), Rachel Melas (acoustic bass), Conny Nowe (guitar), Dave MacDougall (drums and percussion). Egalité: the String Quartet Edition: August 22 | 7pm. Members of New York’s Gretchen’s Muse ensemble perform string quartets by Haydn and Mozart on period instruments. Abigail Karr and Vita Wallace (violins), Kyle Miller (viola), Beiliang Zhu (cello). Strings of Change: August 25 | 4pm. Sharon Lee (violin), Sybil Shanahan (cello), and Rob MacDonald (guitar) perform music by Paganini, Giuliani and Bach, and give the world premiere of Kevin Lau’s Winds of Change. Elemental: August 29 | 7pm. TorQ Percussion Quartet explores the primal elements – earth, water, air, fire and more – in music by Steve Reich, John Luther Adams and members of TORQ. TORQ is: Richard Burrows, Adam Campbell, Jamie Drake and Daniel Morphy. FREE Admission – Allow access to the necessary park. 9 am to 12 pm and 13 pm to 16 pm. Places are limited. To participate, you must register at 819 775-3529. As part of Archaeology Month, team Plaisance National Park, in collaboration with the Ministry of Culture and Communications, invites the public to participate in real archaeological excavations taking place in the territory of the park in Quebec. The site exhibits the remains of a house of the manor of the Petite-Nation from the early 19th century and possibly the site of a trading post from the first half of the 18th century. A unique experience in the area! Activity supervised excavations by archaeologists lasts 3 hours. We form groups of up to 12 people. Schedule groups: 9 am to 12 pm and 13 pm to 16 pm. Up to 16 years, the youth must be accompanied by an adult. Twenty-four food trucks offering a variety of menu options are stationed at five City of Toronto park sites from August 1 to October 1 as part of a City of Toronto food truck pilot project. The food trucks, selected and scheduled by the Ontario Food Trucks Association, will rotate weekly. Two trucks at a time will be stationed at each of the five city-owned parks: Woodbine Park, Roundhouse Park, Canoe Landing, Sherbourne Commons and Allan Gardens. All food trucks are required to be licensed by Municipal Licensing and Standards and must obtain a permit to operate in a City park. Under existing bylaws, new food trucks are not permitted to operate on the public right of way (streets, boulevards and sidewalks). Operators negotiate with private-property owners for locations. City Council has directed staff to consider expanding permission for food trucks to operate on the public right of way. and address issues associated with harmonizing the licensing and regulatory framework for street food vending across the city. The results of this project, along with recommendations related to improving street food vending for food carts and food trucks, will be reported to the Licensing and Standards Committee in advance of the spring 2014 vending season. Public Survey: You are invited to fill out a survey about street food vending at http://cityoftoronto.fluidsurveys.com/s/streetfoodsurvey . Please click here for more info about Toronto Food Truck Project. Ontario is on track to begin construction of the Union Pearson Express station at Union Station this August, ensuring train service to and from Pearson International Airport in time for the 2015 Pan/Parapan Am Games. The new station will be located in the Skywalk immediately west of the Union Station train shed, connecting travellers to the busiest transportation hub in the country while seamlessly integrating with GO Transit, TTC and VIA services already available at Union Station. Travel time between Union Station and Pearson International Airport will be about 25 minutes, with trains departing every 15 minutes and stopping at the Bloor and Weston GO Stations. The platform at Union Station that will welcome riders from Pearson International Airport has officially started construction. A 25-minute train ride will take riders to and from downtown Toronto and the airport. EllisDon was has been awarded the $24-million contract for construction of the station in downtown. The UP (Union Pearson) Express is expected to be fully operational in summer 2015, just in time for the PanAm ParapanAm Games in Toronto. Work already underway includes building a station at Terminal 1, constructing a three-kilometre rail line that will connect the new station at Terminal 1 to Union Station, upgrading and improving Bloor and Weston GO stations, expanding the rail line and manufacturing the vehicles. Construction of the entire Union Pearson Express system is creating and supporting more than 1,200 jobs. More than five million people travel between downtown Toronto and Pearson International Airport each year and that number is expected to reach nine million by 2020. Metrolinx will own and operate the Union Pearson Express. Eighteen Tier 4 clean diesel vehicles have been purchased from Sumitomo Corporation of America. These vehicles are 75 per cent cleaner than standard diesel trains and will be convertible to electric propulsion. Please click here for more info about Union Pearson Express. Goodbye Graffiti is a Toronto-based graffiti removal company. The contract will see Goodbye Graffiti clean up graffiti vandalism on City property and, through Municipal Licensing and Standards investigations, on private property. For City of Toronto residents who have received a Notice of Violation for graffiti vandalism on their private property, which requires that they arrange and pay for its removal, Goodbye Graffiti has offered a 15 per cent discount on its services as well as to remove any hate- and violence-related graffiti free of charge. The contract is valued at approximately $400,000 a year for up to five years. This initiative is part of the City’s Clean Toronto Together campaign to keep Toronto streets clean and free of litter, posters and graffiti vandalism. Council Highlights is an informal summary of decisions made by Toronto City Council. The City Clerk provides the formal documentation at http://www.toronto.ca/council . Support for a Scarborough subway. Council confirmed its support for a Scarborough subway contingent on the provision of new federal funding equal to 50 per cent of net capital costs and a provincial contribution of $1.8 billion. Council specified that no funding outlined in the Metrolinx/City of Toronto master agreement is to be re-allocated from the Sheppard LRT (light rail transit), the Finch LRT or the Eglinton LRT to fund the proposed extension of the Bloor-Danforth line (the Scarborough subway project), and there is to be no reallocation of City revenues from other services to pay for the subway. Council also approved other actions and conditions for the subway project, including a commitment to fund the City’s share of the costs by means that include property taxes and development charges. Loss of provincial pooling funds. Council voted unanimously to urge the provincial government to rescind its recent decision to eliminate Toronto Pooling Compensation funding or, at a minimum, to maintain the social housing component of the funding. The province recently announced that $149.4 million in Toronto Pooling Compensation – most of which Toronto uses for social housing expenses – will be phased out starting next year, ending in 2016. The loss of the funding would result in an increase in property taxes and/or a reduction in services for some of the most vulnerable people in Toronto. Water infrastructure and flood damage. Council adopted numerous motions concerning water infrastructure and damage caused by the July 8 rain storm/flooding. Actions to be taken as a result of the motions include, for example, requesting provincial and federal financial assistance to help pay for damage caused by the flooding, considering an increase in City subsidies available to residents for basement flooding protection, and working on ways to finance increased investment in Toronto’s water and sewer infrastructure. Council decided to not adopt a request made in a petition from the Toronto Taxpayers Coalition calling for changes to Toronto ward boundaries to make the wards match the federal ridings in Toronto. Council authorized the City Solicitor to defend the City’s position if Council’s decision on the petition is legally challenged. The City recently commenced a ward boundary review that is expected to result in changes to ward boundaries for the 2018 municipal election. Council amended the Toronto Fair Wage Bylaw to increase the Schedule C wage rates, which include wage rates for workers performing cleaning services for the City and its agencies. All fair wage schedule rates will now be updated every three years by the Fair Wage Office to ensure they remain consistent with prevailing market rates. Child-care funding model for Toronto. Council endorsed principles and evaluation criteria to guide the establishment of a new child-care funding model for Toronto. The model, tied to a new provincial child care-funding framework, is a made-in-Toronto funding model for child-care programs to support Toronto families. The report considered by Council emphasized that at present, provincial allocations do not support the growing demand for fee subsidies in Toronto. Among recommendations adopted regarding services for, and welfare of, immigrant children, Council agreed to ask the federal government to establish a data collection system at Canada’s ports of entry to facilitate gathering statistics on unaccompanied minors and children who arrive in Canada to be reunited with their parents/step-parents. The information would be shared with providers of child welfare services. Council approved a framework for the development of a Toronto Youth Equity Strategy supporting youth at high risk of marginalization. The strategy will emphasize engaging and supporting youth who are furthest from social and economic opportunities and at highest risk of violence and victimization, while pursuing any related opportunities that benefit all Toronto youth. Toronto Pan Am/Parapan Am Games showcase. Council endorsed the Host City Showcase Program for the Toronto 2015 Pan American/Parapan American Games, with anticipated expenditures of up to about $20 million for 16 showcase initiatives supporting Toronto’s role as the official host city. Council also approved the establishment of a reserve fund for major special events, initially as a reserve for the Pan Am/Parapan Am Games. The Games in August 2015 are expected to draw at least 10,000 athletes and officials and up to 250,000 visitors to the Toronto region. Council decided to ask Transport Canada to advise the City of Toronto on the status of the Railway Safety Act review and to expedite the implementation of new safety protocols for Canada’s railway system. The motion adopted by Council also directs staff to review railway safety in Toronto to determine if there are any steps the City can take to improve public safety locally with regard to dangerous goods transported through Toronto by rail. Get the complete Council Highlights summary via the following ways. Formal documentation of Councils decisions: http://www.toronto.ca/council . Questions about Council meetings and decisions: clerk@toronto.ca or 416-392-8016. Information about distribution of this summary: stratcom@toronto.ca . The Council Highlights summary is also made available as a podcast shortly after the email distribution of Council Highlights at http://www.toronto.ca/podcasts/ . Toronto City Council has directed staff to consult broadly with the local music industry regarding the formation of a Toronto Music Advisory Committee. The purpose of the advisory committee is to assist with the creation of a strategic action plan that maximizes the impact of City support for the Toronto music industry, including the preferred forms of support. Drake’s OVO Sound, a Toronto-based record label active in developing and promoting local musical talent, has offered to work with the City on this project. OVO has made Toronto an international tourist destination through its annual OVO Fest festival and concert scheduled for this weekend at the Molson Amphitheatre. The provincial government recently established a three-year, $45-million Ontario Music Fund to support the production, distribution, performance and international promotion of music made in Ontario. Toronto is developing its own local strategic action plan working in collaboration with the Province. On October 24, the Economic Development Committee will receive staff recommendations on the structure, mandate and terms of reference for the Toronto Music Advisory Committee. The intersection of Eastern Avenue and Cherry Street in Toronto will be closed in all four directions for TTC streetcar track work from Friday, August 2 at 9:30 a.m. to Tuesday, August 6 at 5 a.m.
Traffic travelling eastbound on Eastern Avenue will be diverted to Sumach Street. Traffic travelling westbound on Eastern Avenue will be diverted along Richmond Street. Traffic may re-access Eastern Avenue via Parliament Street. In addition, vehicles travelling on the Don Valley Parkway ramp to Richmond Street will not be able to access Eastern Avenue. Local access will be maintained during the construction period. Alternative eastbound and westbound routes include Queen Street or King Street. Parliament Street and Jarvis Street are alternatives for northbound and southbound traffic. The Scotiabank Caribbean Carnival Toronto (formerly Caribana Parade) will involve the following road closure. Lake Shore Boulevard will be closed in both directions from Colborne Lodge Drive to Strachan Avenue from Saturday, August 3 at 12:01 a.m. to Sunday, August 4 at 6 a.m. Businesses in the area will be open to pedestrians but some roads will be closed to vehicles. The intersection of Spadina Avenue and King Street West will be closed in all four directions, for TTC track replacement work and partial reconstruction of the roadway and sidewalk, from Tuesday, August 6 at 10 a.m. to Tuesday, August 20 at 6 a.m.
All eastbound traffic on King Street approaching Spadina Avenue will be detoured to Bathurst Street, Portland Street or Brant Street. All westbound traffic on King Street approaching Spadina Avenue will be routed to John Street, Peter Street or Charlotte Street. All northbound traffic on Spadina Avenue approaching King Street will be detoured to Bremner Boulevard, Blue Jays Way or Front Street. All southbound traffic on Spadina Avenue approaching King Street will be routed to Queen Street, Richmond Street or Adelaide Street. Alternative eastbound and westbound routes include Front Street, Adelaide Street and Queen Street. Bathurst Street and University Avenue are alternatives for northbound and southbound traffic. A safety barricade will be placed around all four sides of the intersection, providing a safe barrier between the construction and pedestrians. Pedestrian access to businesses and walkways will be maintained on all sides during construction. As a result of this work, there will be no streetcar service on the 504 King and 508 Lakeshore between Shaw St. and Church St.
Service on both routes will be diverted to Queen St.
Customers using the subway can access the 504 King and 508 Lakeshore at the Queen and Osgoode subway stations. Normal streetcar service on King St. will resume on Aug. 20. The construction work will also require changes to the 510 Spadina streetcar. Streetcars on Spadina will be replaced with a curb-side bus operation from Spadina Station to Queens Quay. Starting Aug. 20, streetcar service will return and operate to Charlotte Loop. Bus service on Spadina Ave. will continue to operate from King St. to Queens Quay. The City recently introduced T.O. INview, a map that shows information about planned capital construction work taking place across the city. The Scotiabank Caribbean Carnival Toronto (formerly Caribana Parade) event this weekend will involve a road closure. Lake Shore Boulevard will be closed in both directions from Colborne Lodge Drive to Strachan Avenue from Saturday, August 3 at 12:01 a.m. to Sunday, August 4 at 6 a.m. Residents and visitors are encouraged to come out and enjoy this event. Businesses in the area will be open to pedestrians but some roads will be closed to vehicles. Those who need to drive in the general vicinity of special events should allow extra time to get to and from their destination. More information is available at http://www.toronto.ca/torontostreets/.